This riveting, ever-popular examination of conscience and class has made regular appearances throughout our history and takes pride of place in this historic season. When Inspector Goole arrives unexpectedly at the prosperous Birling family home their peaceful dinner party is shattered by his investigations into the death of a young woman. His startling revelations shake the foundations of their lives and challenge them to examine their consciences. Gripping and thrilling, if you haven?t seen this theatrical masterpiece before ? you must! If you have ? see it again. This play never disappoints. Messenger REVIEW - 5 stars! 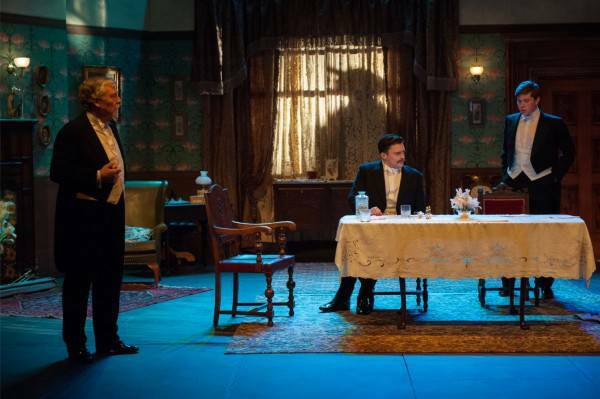 DEEPLY thought provoking and tense, An Inspector Calls is a truly classic play. Altrincham Garrick?s production of Priestley?s masterpiece is so good my eyes were glued to the stage throughout, a tribute to director John Chidgey and a very fine cast. 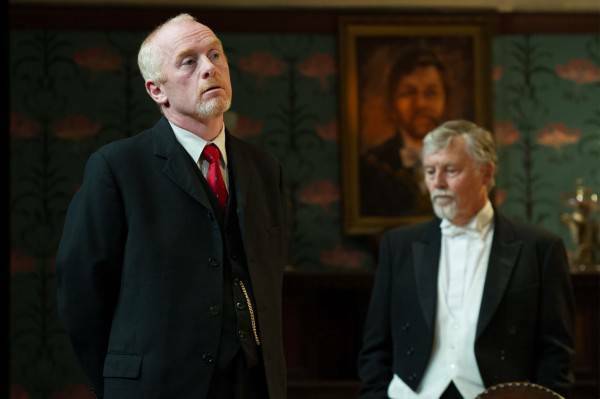 Paul Wilson has a powerful stage presence as Inspector Goole, the mysterious character who ruins the cosy family celebration of the Birlings, with some disturbing revelations regarding a?young woman?s harrowing death of a young woman denied help when she needed it most. I can?t remember the last time a performance excited me so much and I hope this is the start of a long, long association with this 100 year old society. But Paul is in very good company, with Richard Sails excelling as self-made businessman Arthur Birling, a champion of the ?survival of the fittest? philosophy. Beverley Stuart-Cole is positively hateful as Arthur?s horrible, hard faced wife Sybil and it?s impossible not to warm to their daughter, Sheila, thanks to Laura Whitehurst. This character and her brother Eric offer some hope for the future, in a play that?s as much a plea for social compassion as it is a compelling drama. 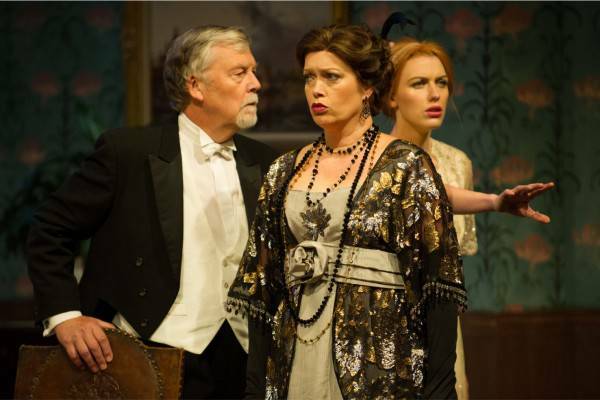 An Inspector Calls played to a packed house on Monday night. 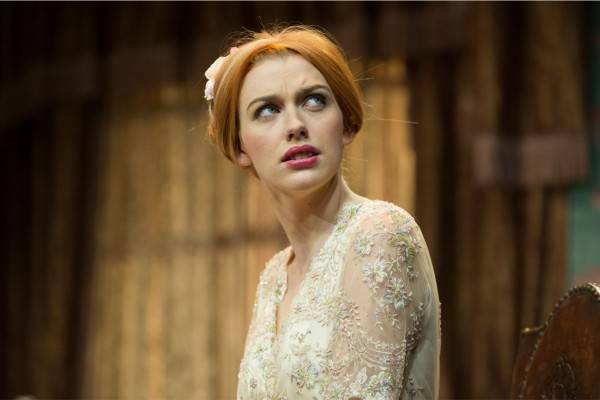 It?d be a crime if this isn?t repeated throughout the run as this is for me, the Garrick?s best production of 2013. All I can remember about the last time the Garrick presented this play two years ago, are the copious amounts of dry ice which were slightly overpowering, especially to those on the front row. The only (very minor) irritation this time is a chair which temporarily blocks the view of the beautiful Sheila Birling, whose engagement to Gerald Croft is celebrated in the opening scene. The atmosphere is relaxed as the Birling family drink port around the table, until the unexpected arrival of Inspector Goole (Paul Wilson). His revelations about the connection of family members to the death of a young, pregnant factory worker insidiously change things. Paul Wilson?s is the key role and he conveys well the manipulative side of his character though he could have been slightly more sinister. Although the Garrick stage is wide the director, John Chidgey, manages to make it feel claustrophobic as one member of the family after the other, is targeted by the wily copper. First on his list is Arthur Birling whose pomposity is well illustrated by Richard Sails. It is intriguing to see his ego slowly deflate under intense questioning. One by one, Arthur?s daughter, Sheila (Laura Whitehurst), her fianc?, Gerald (Anthony Morris), his son, Eric (Tom Sneyd) and wife, Sybil (Bev Stuart-Cole) are implicated. I particularly enjoy seeing the reaction of high and mighty Sybil. Bev Stuart-Cole handles her downfall well as she faces the worst possible outcome ? losing face. The Wardrobe department should be praised for their work, especially the gorgeous dresses worn by Sybil and Sheila Birling. This play is beautifully written by J. B. Priestley whose surprise ending gives food for thought. 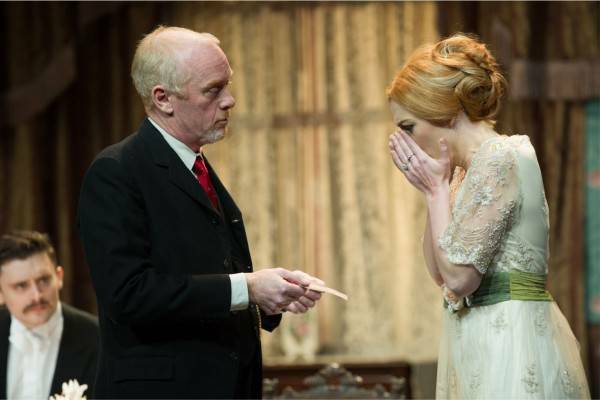 ?An Inspector Calls? - J.B Priestley?s finest piece which focuses on the well-off Birling Family whose night of richness and?celebration?is interrupted by the presence of an Inspector who begins throwing accusations, at all of them, in relation to the suicide of a young working-class girl. The layout of the stage and the quality of the set really gave credit to the piece and the costumes were a vision though the focus was undoubtedly on the quick-paced and hard-hitting acting. There wasn?t a single section of this production that wasn?t enjoyed or appreciated. ? ?The entire cast acted superbly, not a weak link among them. 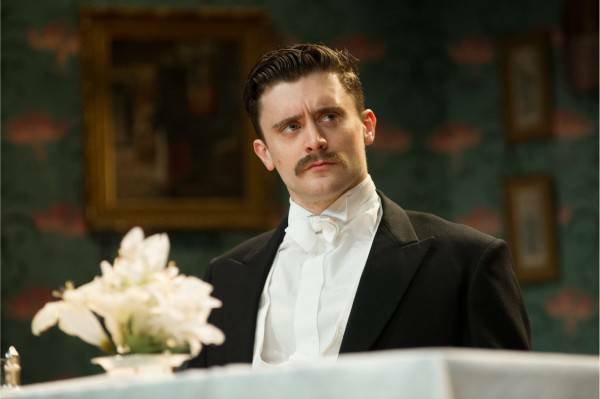 Richard Sails as the bluff and smug factory owner, Arthur Birling. Tom Sneyd, as his son Eric, doesn't over-do the limp dissoluteness. Paul Wilson as Inspector Goole (entered in the recognisable raincoat and trilby) is Scottish, which works well whether deliberate or just happens to be so! Bev Stuart-Cole was transformed into the hard faced Sybil exposing her versatility as a performer as was Anthony Morris, as Gerald, who excels when playing something he can really grasp and sink his teeth into ? a grand job! I adored Laura Whitehurst in the role of Sheila, she literally through everything into her performance which left her an emotional wreck ? entirely believable. A great team was evident in this cast; they gelled, were well balanced and clearly loved every minute of it ? magic! This piece is traditionally one act, though an interval had been included, for reasons I've guessed and completely understand, though the decision was made to start the second act repeating the last two minutes from where we broke, this is a nice idea though I was a little confused as to why the blocking had changed for the second time around, was this a simple oversight? Judging by the standard of the production I find something so blatant hard to believe so began questioning whether it was deliberate to suggest that ?something isn?t right??? Whatever the reason or fault, the interval worked in this productions favour as it was the break which highlighted to me how much I?d been engrossed as I didn?t want it to end and couldn?t wait for the second half to kick off again. The message that ?we must never forget our social consciences and the way in which we treat those around us, especially those less fortunate? was conveyed at the right level. There really isn?t much more to say other than this was a faultless and incredibly impressive production which has stayed prominent in my mind for several days after. Congratulations to Director, John Chidgey, the cast and committee for a triumphant production! 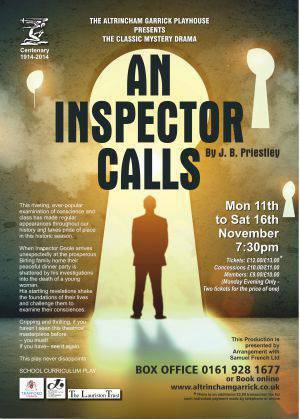 ALTRINCHAM Garrick?s next production is a modern day classic, An Inspector Calls. You can enjoy the play on two levels, both as a tense and atmospheric thriller and as a veiled attack on the class system, and the indifference of those at the top to those at the bottom of the social pile. The mysterious and at times menacing Inspector Goole turns up at the home of the well-to-do Birling family and the party spirit quickly falls flat when Goole, who doesn?t suffer fools gladly, announces he?s investigating the death of a young woman. Goole, the grand inquisitor, ensures there are some uncomfortable times ahead for the Birlings and Paul Wilson is playing what he describes as a ?classic? part for the Garrick. He said: ?The inspector is one of the classic parts and with a director like John Chidgey who challenges you to get inside the part I jumped at the chance.? What makes it such a special part to play? ?it's the mystery that intrigues you. Is this inspector who he appears to be? He comes in and blows apart the comfortable and bourgeois family. 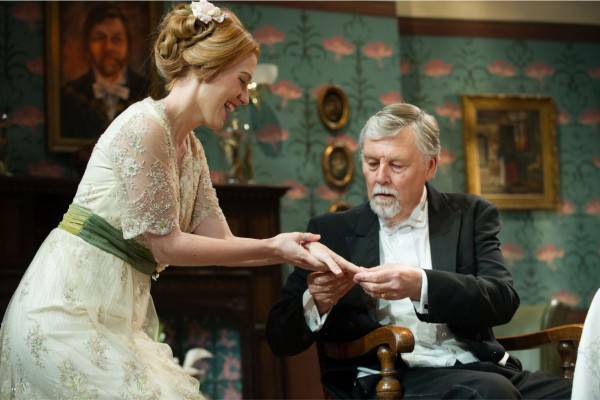 The Inspector is the moral conscience of this play yet you never get to know anything personal about him. ?